The following article was published in volume 13 of Animation Journal edited by Maureen Furniss. Get your copy here. Since the later part of the 19th century people have been interested in the fourth dimension. Very popular at that time it fascinated and left room for all kinds of speculations. A lot of assumptions have been made. Some people even assumed it must be the place where god resides, heaven. Especially artists took a great interest in the fourth dimension. Writers like H. G. Wells, Alfred Jarry and Fyodor Dostoevsky and avant-garde artists like Marcel Duchamp, Francis Picabia, František Kupka, Kazimir Malevich, Umberto Boccioni and others were influenced by its theoretical implications. Marcel Duchamp even studied higher dimensions very seriously. In his work The Bride Stripped Bare By Her Bachelors, Even (The Large Glass) the bride (see picture below, left) was meant to be a four-dimensional entity in contrast to the more simply constructed three-dimensional bachelors. 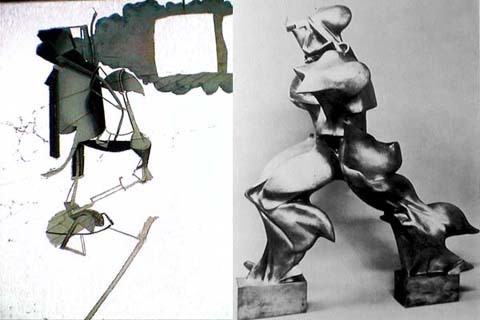 Another example would be Unique Forms of Continuity in Space (see above, right) a sculpture by Umberto Boccioni. It can be said that some of the avant-garde styles like Cubism, Futurism, and Constructivism emerging at that time were highly influenced by the expanded vision of space the fourth dimension offered. This all changed when Einstein made time the fourth dimension in his theory of relativity. The extra dimension that was undefined and mysterious before now served a scientific purpose to better understand our universe. People became more interested in Einstein’s discoveries and what would result from the assumptions he made. But with the rise of computer technology some scientists returned to the fourth dimension for purely geometrical studies. Through animating four-dimensional objects in motion not only fascinating abstract images emerge but also the almost incomprehensible, dry theory becomes a bit more accessible by rather seeing patterns and structures than reading about them (unless you are a mathematician of course). With this essay I’d like to share my fascination with the fourth dimension in motion that brought me to making “Gestalt” a computer animation featuring four-dimensional fractals called quaternions. Another subject I’d like to touch briefly is fractals. 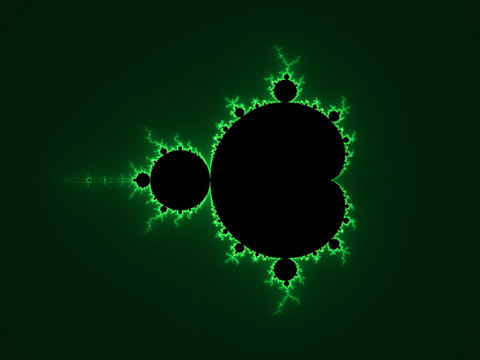 I have long been fascinated with fractals. When my brother showed them to me on his computer I was in awe that these beautiful patterns not only have such interesting features like self similarity but were also created by using only a simple formula. We tried to make small animations of zooming in their structure by taking single frames from the monitor screen with our dad’s super 8 camera while we were changing the parameters of the formula. The results were not very satisfying for both of us due to the technical limitations. But first please let me introduce you to the fundamentals of understanding four-dimensional geometry. Next I’ll try to give a brief introduction to quaternions, the fractal entities living in 4d space. Freshly equipped with a basic understanding of the subject matter I will then give some examples of 4d related animations artists and scientists have done so far. In 1966 Michael Nöll and his associates at Bell Laboratories produced an animation of a hypercube using computer graphics. It was the first time a hypercube was visualized in motion. 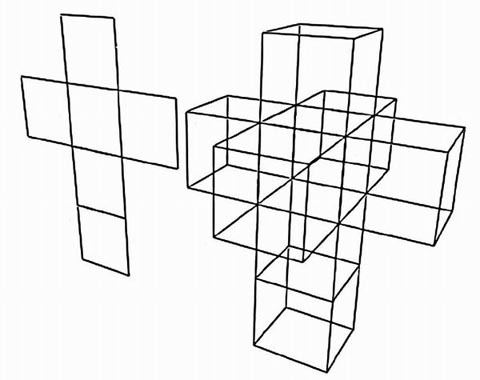 Later in 1978 Thomas Banchoff and Charles Strauss produced the film “The Hypercube: Projections and Slicing”. 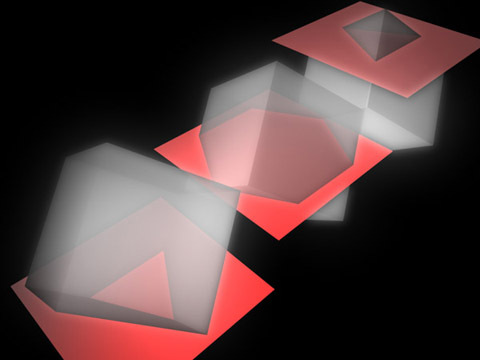 This award winning film shows a more complete approach to the animated hypercube. A hypercube is a four-dimensional cube. Now what does that mean? Before I try to explain the concept of four-dimensionality I’d like to give a few words of advice. To understand the fourth dimension, don’t try to understand the fourth dimension. With this cryptic sentence I’d like to point out that you should not try too hard to ‘understand’ the fourth dimension, e.g. how it looks like in the real world. There is no fourth dimension in reality. It’s a concept of an artificial space that bears no direct similarity to real space. Try to think of it as geometrical extravaganza. It is constructed with mathematical means by analyzing three-dimensional space and how the three dimensions relate to each other. The extra dimension is added due to the geometrical laws found in the first three. Think of it like for example the concept of eternity which you don’t find in the real world either or the concept of negative numerical values. In reality you can count the things you see but things are either there (positive value) or not there (zero value) but how can they be negative? The concept of negative values only makes sense if you work with numbers in an abstract way. Of course we are used to them and they don’t appear strange to us anymore but it is an altogether abstract and artificial concept similar to the one of a four-dimensional space. To get an idea of the fourth dimension maybe it would be a good start to begin with a point. A point has zero dimensions. It only exists in itself and has no possibilities to move anywhere. If we put another point at the right side beside the first one and connect them we get a line. A line has one dimension. It is now possible for the zero-dimensional point to travel within the line in a left and right manner. Now we move the line perpendicular to itself in a plane and we get a square. A square has two dimensions. The point can now travel left and right as well as up and down. Moving the square perpendicular to itself results in a cube. 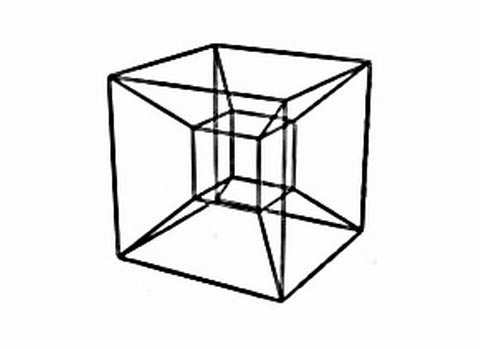 A cube has three dimensions. The point is happy because it can travel even more. It can now move in three directions: left and right (x-direction), up and down (y-direction) and back and forth (z-direction). So now to make the point even happier we move the cube perpendicular to itself in kata direction to get a hypercube. So here it is, the four-dimensional hypercube. The point can now move in four directions: left and right (x-direction), up and down (y-direction), back and forth (z-direction) and ana and kata (w-direction). As you might have noticed the point can travel now in a direction (ana and kata or w-direction) that we, bound to three-dimensional space, can’t go. This is the new direction that makes the fourth dimension. But what about time being the fourth dimension? Well, time can be the fourth dimension. It would then be called four-dimensional space-time and is used in Einstein’s famous Theory of Relativity. In geometry it is possible to extend space to as many dimensions as you want. The same way we moved the cube perpendicular to itself into hyperspace (four-dimensional space) to get the hypercube we can lift the hypercube perpendicular to itself into five-dimensional space to get a five-dimensional hypercube. This could be done again and again up to n-dimensions. For our zero-dimensional point each additional dimension means one direction more to move in. Since our three-dimensional space can be described in mathematical language it is possible to extend it by mathematical means even though in our physical world we do not have access to it. You can see the dark inner cube change position due to the rotation in 4d space. Also the cube is squashed during the process. Now you can just put all the slices you made for one frame each and you have an animation of a continuous 3d slide of a hypercube. Instead of further explaining the technical side of quaternion fractals I’d rather like to give some personal account of my own work in the realms of 4d quaternion animation. While I was investigating 4d geometry, I stumbled upon quaternion fractals. I was fascinated by the universe of bizarre shapes and forms that could be expressed by a single mathematical formula. Wondering how it would look if I changed some parameters over time, I experimented with animating them. I was captivated by the results. The program I used for renderingquaternions I found on the web. It’s called Quat and was written by Dirk Meyer. 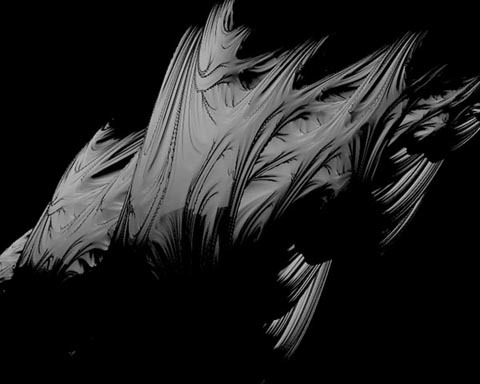 It’s a very powerful quaternion fractal generator that is freeware. Unfortunately it is only possible to render single images with this software. So I had to write my own little program that would feed Quat with data for sequences of slowly transforming shapes to render. I fiddled with every parameter that could be changed and did series of images while gradually changing one or more parameters to test if something promising would develop. This procedure posed a real challenge to my patience. Though I did only small resolution test renderings they sometimes took half an eternity to finish. But at the same time I was really enthusiastic about the results I got. When I had enough material I began rendering the sequences I liked most in a higher resolution. That was the biggest challenge to my patience ever. It took almost a year and would have taken even longer without the help of family and friends who donated computer time. So after the renderings were finished I just had to put the sequences together in a way that made sense to me. I tried to show many facets of the mathematical body and transformations of it. For the soundtrack I referred to FM-Synthesis. I like the sound of it and found it matched the bizarre, highly artificial, somehow alien shapes. I named the film ‘Gestalt’ and it’s available for download on my website. Now please let me elaborate further on my fascination with fractals, the fourth dimension and mathematics in general. It was Pythagoras who made the belief in numbers central to his worldview. He founded the Pythagorean Order who tried to live science, to directly integrate scientific observation in practical life. Their aim was to understand the divine order of the world. It was believed that this order was a mathematical one. For them numbers weren’t arithmetic alone but entities of their own. It was these entities that were divine because in their worldview they alone had the power to fully explain the universe. In modern physics today there is one branch that dedicates their efforts to finding the one theory to describe the order of the universe. Superstring Theory. This theory is by no means completely understood even by the people working on it. It’s said that scientists stumbled on this theory that was originally meant for the next century to discover. And it’s also not quite clear if this theory actually works. There is a lot of controversy. But the scientists who dedicate their life to it are captivated by its elegance. Superstring Theory uses higher dimensional space. It places unimaginably small vibrating strings as the basis for all matter and comes in different flavours of which the ‘smallest’ is embedded in a 10 dimensional space and the ‘biggest’ makes use of a 26 dimensional space. Superstring Theory is an attempt to unify all four forces (gravity, electromagnetic force, weak nuclear force and strong nuclear force) which according to physicists constitute our universe. These aspects of numbers, mathematics and science are central for my approach to ‘Gestalt’. Actually working with the tools (numbers, mathematics) used to explain the fabrics of space I sometimes felt like a painter who some centuries ago used to paint biblical scenes to let the beholder feel a glimpse of the divine. If you browse the internet looking for 4d related sites you find very diverse applications of 4d geometry. I’ll try to give a short summary of what I found during my quest for 4d stimulus. I’d like to focus on three contemporary artists influenced by the fourth dimension. First the painter Tony Robbin, who also wrote a book on the fourth dimension and art called ‘Fourfield: Computers, Art and the 4 th Dimension’. He also wrote some programs to visualize higher dimensional objects which can be downloaded at his website.For his paintings he transfixes complex patterns derived from his research in 4d geometry on canvas. On some of them wire arrangements are added to provide even more depth. With the wire structures changing in perspective when passing the painting the painted structures remain fixed on the canvas-space. This interplay of perspective and motion directly refers to phenomena that can be observed in hyperspace. Another contemporary artist working with 4d geometry among other tools is the ‘transarchitect’ Marcos Novak. His liquid architectures / transarchitectures as he names them are highly elaborated spaces that exist in cyberspace. cyberspace here means the space that only can be provided by a computer and far surpasses the notion of space as we know it. Whereas architects use the computer as a tool to construct for the real world he rather constructs for the same space he constructs with, the virtual space. Since the virtual space of the computer is made of mathematics alone it can be extended and broadened by mathematical means. Marcos Novak makes full use of this fact. A lot of 4d animations can be found on the web. Most of them are very short. They show for example what a 4d object looks like when rotated in 4d space. Also the slicing method is sometimes used to explore certain properties of 4d objects. Thomas Banchoff’s Project List Very interesting animation studies by the author of ‘Beyond the Third Dimension’ and producer of ‘The Hypercube: Projections and Slicing’. Gallery of Mathematics Very nice animations of for example a hyper-torus and an inflated hypercube. Also very thorough information on the mathematics involved. Hyperspace Star Polytope Slicer A java applet with lots of parameters to fiddle with. Should not be missed. Among other things a vrml model of a Calabi-Yau manifold a 6d object that is important to Superstring Theory. Beyond the Third Dimension This virtual exhibition consists of mathematical objects that are visualized in the computer. It shows relations between Mathematics, Art and Computer Graphics. Its images try to suggest geometrical intuitions evoking the mathematical notion of dimension.